Highlights: A mountain trail that follows the spine of the Sherman Mountains, traveling through conifer forests and open meadows, passing rugged rock formations with frequent expansive views. Location: Near the summit rest area of I-80, on the eastern side of the Pole Mountain Unit of the Medicine Bow National Forest. Distance: Three to four miles, end to end. Guide: Marc Smith’s Hiking Wyoming’s Medicine Bow National Forest ; Bill Hunger’s Hiker’s Guide to Wyoming . Trailhead: Take I-80 west from Cheyenne about 37 miles, exiting at the summit rest area, exit 323. To reach the trailhead go right on Forest Service 705 just beyond the rest area parking lot. The “Summit Trailhead” parking area is on the left, .2 of a mile past the rest area. To park at the trailhead you’ll need to pay a fee, currently $5 per vehicle. If you want to avoid it park in the rest area lot and walk the extra .2 mile. (If you’ve hiked it before you’ll see that the trailhead has been moved about a quarter mile further to promote revegetation of the old trail.) To reach the south trailhead turn left from the I-80 exit on Happy Jack Road (WY 210). Continue five or six miles, turning right on FS 707. The trailhead is about two miles on your right and is well signed. The hike: This is a well marked (with posts) and well maintained National Recreation Trail, blazed originally in 1868 by William Lovett. It is surprisingly wild in spite of being so close to the interstate. From the Summit Trailhead the route climbs a little, then begins its journey along the side of the rocky granite ridge of the mountain. After about a mile the route divides, with the right fork going out to a grand overlook. The trails come together and travel through ponderosa pine forests, aspen glades and open meadows. Browns Landing is a broad park worth exploring. Brown was an outlaw road agent who kept his hideout here prior to the coming of the railroad in 1869. The trail enters the trees briefly before it makes its steep plunge down the west side of the mountain. It drops 480 feet in three quarters of a mile bringing you to the south trailhead. This trailhead is at the edge of what once was the Pole Mountain Military Reservation Headquarters. Pointers: You are not likely to find water along the trail so you will need to carry all you need. This place can be very hot in summer, so spring and fall are best. Keep an eye out for mountain bikers who use the middle section of trail, coming in from the Tie City trailhead. This entry was posted in Wyoming and tagged Headquarters Trail, Hike, Hiking, Pole Mountain, Sherman Mountains, Southeast Wyoming. Up until the early 1970s, the Headquarters/Pole Mt trail was open to motorized vehicles. Much of it is narrow two track, such as an early Willys Jeep would have made. It was listed as #791 on several maps. Interestingly, there was a connector trail/road #792 that seemingly disappeared off Forest Service maps after about 1973 vintage. I believe I may have located where it started from and ended using Google Earth. Will take the old camera this coming spring hopefully and walk it. There is one online reference to a “Wallis Trail” #792, but the description of the direction the trail travels would not link up to the HQ trail. We will see! Kurt & Des, What an amazing trip! Spectacular views. Such baeuty in nature the Lord created for us to enjoy thanks for sharing for those of us who don’t get to go on high adventures! Hello all. I am attempting to find out more information on the Headquarters/Pole Mountain Trail to determine its historical significance. 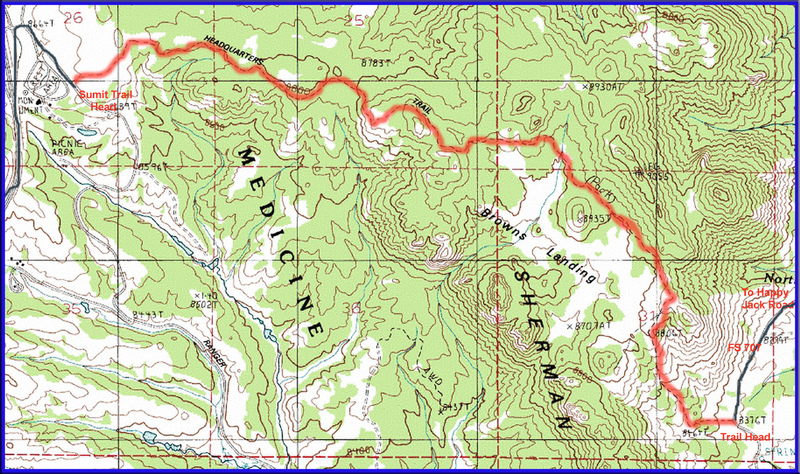 There is a trail marked on the 1935 “Fort Francis E. Warren Target and Maneuver Reservation(Pole Mountain) Grid Zone E” Map labeled “Pole Mountain Trail” which connects what is now I80 (and was the Lincoln Hwy) to the main Headquarters Camp of the reserve on the east side of the Sherman Mountains…that 1935 trail does seem to partially overlap the existing Summit and Headquarters trails segments. (The 1935 trail does NOT show up on the 1929 Pole Mt. map.) Does anyone know any more information on when the trail was constructed and by who? It is possible the Army constructed the trail…maybe as a shortcut to the camp from the west? Thanks in advance!